My yoga mat has become a sacred space, imbued with my own energy — de-frenzified for a few moments. When I roll it out and begin my practice, my body responds by breathing more deeply. My mind responds by yoking itself to my breath and my body. My spirit responds by settling in, by more fully occupying the cells of my physical body. One morning this month, my spirit soared over the mat next to me. My son joined me at yoga class. 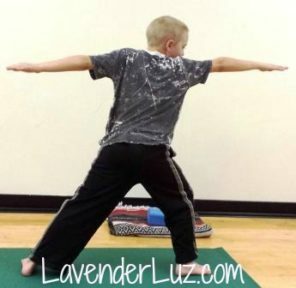 Not just because he’s an athlete and knows that doing yoga will help him gain strength, flexibility, balance and focus. But just to be with his mama. My son got up early on a day off to hang out with me doing what I like to do. Yoga wasn’t easy for him. He struggled but didn’t quit. For the final pose, savasana (corpse pose in which all you do is relax, the yin to the rest of the practice’s yang) our hands reached out to each other, loving through our bodies and souls. In that moment of union, all was perfection. Love this!!! Especially the mind-movie of the final pose. Priceless!! What a nice story… boys can be so lovely and sweet. Thank you for sharing this perfect moment…will nudge me find one in my day! I bet you wanted to lie in that resting pose forever! Beautiful post, Lori. How very sweet! I think being present and recognizing a perfect moment is a skill that you captured. Lovely. I have been doing yoga with my daughter sometimes, although she is much better at it. It’s been wonderful. Our children grow-up so quickly. I love how you have found a way to savor the sweet moments. A very sweet moment. I love that your hands came together between your mats. Pingback: The Infertility Voice | Today is D-Day.